The vast Kalahari Desert stretches across Namibia, Botswana and South Africa. The Kalahari Desert is a vast region with a low rainfall and far more sand than vegetation. In the south, it is like a desert, and yet it is able to sustain many animals and plants. The Kalahari is a flat expanse of land where the days are scorching hot, with the nights being very cold. Within the Kalahari, you will find a number of game reserves of which the Central Kalahari Game Reserve, Khutse Game Reserve as well as the Kgalagadi Transfrontier Park are the most prominent. Animals that are found in the area include meerkats, brown hyenas, lions as well as many antelope and birds. It is home to the few remaining hunter-gatherers of Southern Africa - the San (or 'bushmen',) who survive by still hunting with their bows and arrows. They also gather plants like berries to eat, as well as insects and nuts. Bushmen can get by without drinking much water, receiving their water supply from the desert melons they eat and storing water in empty ostrich egg shells. The Kalahari's biggest attraction, particularly in the modern rat-race days, is its silence and solitude. Tiny populations of people live in the Kalahari, and sheep farmers make up much of the employment market. Game drives and walking trails have assisted the region in becoming a popular tourist destination. The Kalahari Desert is not a desert consisting purely of sand dunes, as one might imagine. It is rather a land of dunes with grass plains. This means that there is more vegetation than in a normal desert, with the result being that there are more plants and therefore more animals. By visiting the Kalahari, you can see both the desert, interesting plants and interesting animals. The Kalahari in Namibia is home to some of the most striking salt pans. With entire parks named after the salt pans found in their regions, it is no wonder that they count amongst the main attractions of the area. The pans cover a large area of the Kalahari Basin and form the bed of ancient lakes. They make for extraordinary views and offer astonishing photographic opportunities. The San people, who have lived in the Kalahari Desert for 20 000 years, still live there today. They live in huts that are built from material all found in the Kalahari Desert, and still live as their hunter-gatherer ancestors did. When you visit the Kalahari Desert in Namibia, you will get to learn how they have survived for so many years, in a way that is vastly different to Western civilization. 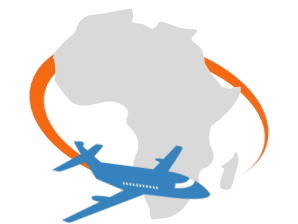 There are no commercial flights to the Kalahari Desert, though the area does host several private air strips. Guests will be welcomed at OR Tambo International and assisted in transferring to Windhoek Hosea Kutako International Airport, which is conveniently situated on the edge of the Kalahari. Guests may then take a light aircraft to their lodge in the Kalahari, depending on the destination. The Kalahari Desert is situated in the eastern part of Namibia. The desert is quite extensive and there are various lodges hours away from each other. From the Windhoek Hosea Kutako International Airport, the closest lodge is just under 200km away. If you are not flying directly to one of the lodges, the private 4x4 drive gives you the opportunity to see a larger part of the country. The Kalahari Desert in Namibia can get extremely warm. During the summer, temperatures can climb to 45 degrees Celsius during the day. The 'desert' rarely receives more than 100mm of rainfall during a year, and most of the rainfall is during the thunderstorms that rage in the Kalahari Basin between December and April. The dry season, in the winter months from June to August, is better for viewing animals, as the animals are forced to come to the waterholes and riverbeds to find water. The average temperature is around 25 degrees Celsius, which is pleasant. The nights, however, are extremely cold, so you should definitely bring warm clothes to bundle up in. The Kalahari existed as an inland sea during the Cretaceous period, which was between 65 and 135 million years ago. The fossil dune fields have documented periods of greater humidity and more aridity. The first European to cross the Kalahari Desert was David Livingstone, in 1849. The Voortrekkers also traveled across parts of the Kalahari Desert in the 1870’s. Many people and a lot of cattle died on this journey, due to the lack of water. There have been Europeans in the Kalahari Desert since Livingstone, but only one settlement was formed in Ghanzi. Until quite recently, these settlers lived in poverty, but in recent years they have gained more power. The indigenous people of the Kalahari Desert are the San, sometimes called the Bushmen. San is a Khoikhoi word meaning “outsider”. The San were the first inhabitants of Southern Africa. Evidence suggests that they have been living here as hunter-gatherers for at least 20 000 years. The name “Bushmen” were given to them by Europeans traveling across the Kalahari Desert, and they were so named because they lived in the bush and also smelled like the bush, because they rubbed the aromatic spices from various bushes into their skin. They almost lost their historic land, but after a court case it was decided that they could remain on the land as it is rightfully theirs. There is a rich wildlife in the Kalahari Desert in Namibia. The animals here had to adapt to the landscape, and they can live for long periods while being deprived of water. They cope by mostly eating plants that contain water. The animals found here include rhinoceroses, elephants, lions (both Transvaal lions and Katanga lions), meerkats, African leopards, wild dogs, gemsbok and social weavers. There are also many snakes in the Kalahari Desert, as the warmth attracts them – especially Cape cobras and puff adders. Birds of prey include the secretary bird, several eagles, several owls, falcons, goshawks, kestrels, and kites. Karoo lark can also be seen. There are many threats to indigenous wildlife. Fences have been erected to protect the wild animals from livestock that graze on their land. The grazing removes plant cover from the savanna, depleting its resources. When the wild animals mix with the cattle, this usually enrages the cattle farmers and leads to wild animals getting hunted or poisoned by the cattle ranchers. Many animals that live in the Kalahari Desert are migratory, as they try to follow water around, thus fences can be quite troublesome for the wildlife. The most successful species in the park are the species that can breed all year round whenever there is enough water available, like springbok. 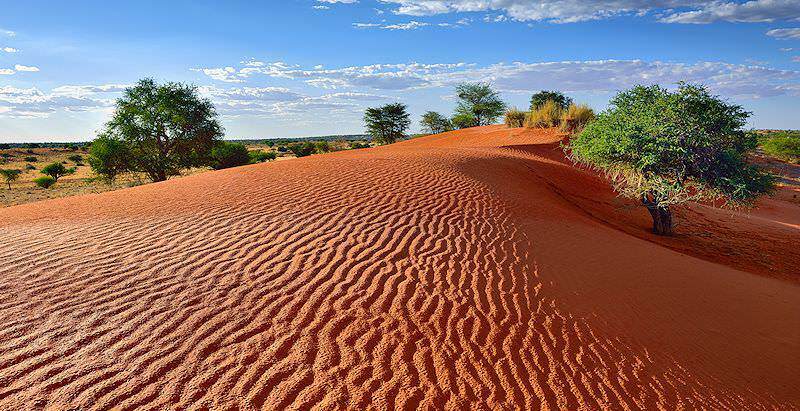 The Kalahari Desert is one of the five geographical areas that make up the country of Namibia. The arid, vast expanse of sand is also the country's most well-known geographical trademark. The desert - although incorrectly titled so, as it receives too much rain to be classified as a desert - spans almost 930 000 km2 across Namibia, Botswana and South Africa. It is the largest part of the 970 000 km2 Kalahari Basin, which stretches even further north into Angola and Zambia. In spite of the fact that the area receives rainfall of above 100 mm annually, the area is best described as a thirstland. as it disappears instantaneously into the sand dunes that cover a large part of the area. The sand dunes, although not very high, are renowned for being the largest continuous expanse of sand on earth, and are surprisingly rich in vegetation, with over 5 000 species of plant that have been identified in the desert. Grass clumps, shrubs and deciduous trees grow sporadically, providing much needed sustenance to the various animals and people that reside in the area. Wild cucumbers, creeping melons, gemsbok cucumbers and Hoodia cactus are some of the endemic edible plants, while the camelthorn, acacia, kokerboom trees are the most noticeable. The trees play an important role in providing shade, as well as in instilling growth in other plants by creating nutrient-rich earth. The Kalahari Desert is so enormous that exploring by 4x4 is one of the easiest and best ways to take in as much of what the region has to offer as you can. Photographic and cinematographic opportunities are endless, from the red sandy dunes, the Kokerboom Forest, the Mesosaurus fossil site to the breathtakingly beautiful sunsets. This is the one place you want to have your camera with you at all times, so remember to pack extra batteries. It is however, imperative that you look up from the lens, especially at night when the skies come alive with thousands of stars. Stargazing in the desert is the perfect way to relax after a day of venturing through the harsh landscape. Guided game drives offer great wildlife viewing, which includes the chance to encounter the elusive cheetah or the formidable black-maned Kalahari lion. Various antelope, such as springbok, gemsbok and zebra, can also be seen. Walks accompanied by expert guides are available, and offer visitors a chance to acquire a more in-depth knowledge of the area. Horse riding is available at some lodges in the area, and it’s a great way to experience the outdoors at the same time as keeping fit. Remember to pack a water bottle or two. The section of the Kalahari Desert that stretches into Namibia is revered for its unique vegetation, fossil sites and awe-inspiring wildlife. The best experiences are oriented around these captivating elements. At the Quiver Tree Forest, which is situated merely 13km northeast of Keetmanshoop, visitors walk amongst the fascinating quiver trees, as well as the dolerite rock formations that are known as “The Giant's Playground”. You will be surprised at the diversity and amount of animals to be seen in the Kalahari Desert. The best time of year to view game is in the winter months – June to August. Some of the animals that you can expect to see include the black-maned Kalahari lion and a large variety of snakes. You can go on a guided tour of the Mesosaurus Fossil Site just outside Keetmanshoop. These rocks and fossils are one of the most convincing pieces of evidence to suggest continental drifting. They have the same genus as rock formations in South America. Is it possible to visit parts of the Kalahari Desert outside Namibia? Yes, just be sure to have your passport handy for crossing borders. Are nights during the summer warm? Not as cold as during the winter, but maybe bring a light jacket. How much time should we spend in the Kalahari Desert? Two nights or more are advised, as the area is quite big. Is it necessary to drive a 4x4 in the Kalahari? 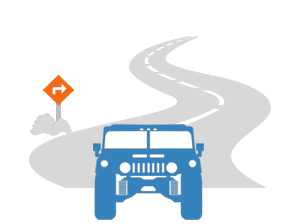 The roads are quite well kept, but you do not need to worry about this as you will be transported in an air-conditioned African Sky vehicle. Will we see animals at all if we visit in December? Yes, they are just few and far between, so looking for them might take longer. Are there malaria-carrying mosquitoes in the Kalahari? No, the Kalahari is a low-risk malaria area. Can we expect to see Bushmen in the Kalahari? Yes, this is where they have lived for thousands of years now and still do now. South Africa's top travel destinations are Cape Town and the Kruger National Park. Botswana is revered for its barely touched safari areas, like the Okavango Delta. Zambia's esteemed national parks include South Luangwa, Kafue and Lower Zambezi. Zimbabwe is best known for its heart-stopping view of the Victoria Falls. Etosha National Park is sought-after for the remarkable game viewing on offer, as a wealth of species thrive here. The Sossusvlei region is replete with unique sights, from Deadvlei's mortified trees to the towering red dunes characteristic of the area. Windhoek's old castles and historic sites make the capital city a pleasant overnight destination during a Namibia safari. Swakopmund is one of Namibia's most beloved destinations, a small seaside hamlet still colored by its German colonial history.